1 Dermatology and Venereology Department, Aleppo University Hospital, Aleppo, Syria. 2 Dermatology and Leishmaniasis Research Center, Kerman University of Medical Sciences, Kerman, Iran. We present a case of a 20-year-old girl in whom plasma cell panniculitis with morphea-like clinical manifestation was diagnosed. She had hyperpigmented indurations over the inner aspects of both thighs extending to the pubic area, causing mild labial swelling, down to the inner aspects of both knees. Skin biopsy showed plasma cell panniculitis favoring a diagnosis of morphea profundus. Another sibling had generalized subcutaneous nodules (2-4 cm, non-tender, mobile, particularly in the head and trunk) with alopecia overlying the scalp lesions. and skin biopsy showed lupus panniculitis. Family history of consanguinity was present, but both parents were unaffected. To our knowledge this is the second report of autosomal recessive plasma cell panniculitis with the clinical manifestations of morphea. aspects of both thighs extending to the pubic area, causing mild labial swelling, and extending caudally to the inner aspects of both knees (Fig 1, 2, 3). Mild hypertrichosis was observed over the thigh plaques. Musculoskeletal and neurologic examinations were normal. Her 18-year-old brother (patient b) had a 6-month history of generalized subcutaneous nodules and a history of a previous attack of the same lesions one year ago. 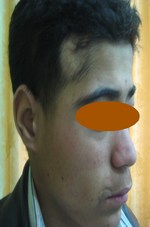 His general health was not impaired and his physical examination revealed generalized subcutaneous nodules (2-4 cm, nontender, mobile, particularly in head and trunk) with alopecia overlying the scalp lesions (Fig 4,5,6). In musculoskeletal examination he had also generalized arthralgia with the difficulty of movement while the neurologic examination was normal. A history of consanguinity was present; the parents were ﬁrst-degree cousins. Laboratory workup of both siblings included complete blood count and differentiated blood count, ESR, C reactive protein (CRP), blood urea nitrogen, creatinine, liver function tests, lipid proﬁle, ANA, ds DNA, Rheumatoid Factor (RF), Serum Protein Electrophoresis and Borrelia antibody titer. Laboratory data were noncontributory except for an elevated ESR [patient (a): 45 mm/h; patient (b): 75 mm/h], CRP [patient (a): +; patient (b): ++], ANA [patient (a): 1:80 speckled pattern; patient (b): 1:160 speckled pattern], RF [patient (a): -; patient (b): +], Hyper gammaglobulinemia was Positive for both of siblings and ds DNA was Negative for them. Fig 4,5,6: Patient (b) showing generalized subcutaneous nodules (2-4 cm, mobile, particularly in head and trunk) that seen alopecia on the lesions of scalp. The histologic sections of [patient (a), taken by punch biopsy (4mm) from right thigh] revealed superﬁcial and deep, intense plasma cellular and lymphocytic inﬁltrate, primarily in the lower dermis and fat septae with spillover to the fat lobules. 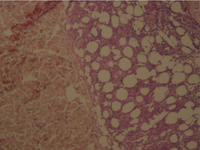 Fibrosis was present in the deep dermis and in the fat. There was no vasculitis. (Fig 7,8). 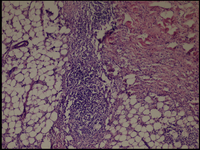 The histologic sections of [patient (b), taken by punch biopsy (4mm) from trunk] revealed superficial and deep perivascular lymphocytic infiltrate with plasma cells in the dermis. Deep lymphocytic infiltration in the fat lobules and in the septa and hyaline necrosis of the fat was present. There was no vasculitis. (Fig 9,10). Patient (b) was treated with prednisolone 25 mg/d for 3 month and then tapered, which reduced number of sub cutaneous nodules. Skin biopsy was repeated and it showed L.E Panniculitis with signiﬁcant reduction in the intensity of inﬁltration. His ANA titer dropped from 1:160 to 1:40. 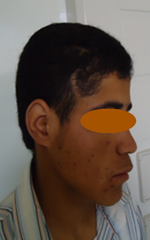 He was visited a year after treatment (Fig 10,11,12); no disease progression was seen. He was lost to follow-up. Patient (a) was treated with prednisolone 25 mg/d for 7 month and then tapered, which reduced induration of the skin, and swelling of the labia. No further improvement was noticed after 6 months of treatment. Methotrexate 7.5 mg/wk was added, which helped in further reduction of induration. When she failed to show further improvement methotrexate was discontinued after 5 month. Skin biopsy was repeated, and it showed Plasma cell Panniculitis with no signiﬁcant change in the intensity of inﬁltration. This persistent extensive plasma cell inﬁltrate for 5 years in the absence of clinical disease progression is intriguing because the inﬂammatory inﬁltrate is observed at the onset of morphea and with time, inﬂammation is replaced by ﬁbrosis. Her ANA titer dropped from 1:80 to 1:40. She was visited a year after treatment; her skin lesions remained unchanged with no further disease progression. occasional eosinophils around small vessels in the dermis and in the Panniculus. This disorder differs from Morphea in that Morphea Profunda has deeper involvement and a more pronounced inflammatory infiltrate. Plasma cells usually are less numerous; however, plasma cells as a predominant cell type in Morphea Profunda have been reported earlier . In patient (a), Morphea Profunda appeared to be the most likely diagnosis because of the extensive subcutaneous thickening and hyperpigmentation without systemic involvement. However, the presence of identical clinical features and a histologic picture of plasma cell panniculitis was puzzling. A family history of consanguinity, unaffected parents, and disease manifestation in two siblings strongly suggest an autosomal recessive inheritance. The clinical picture of our patient is similar to a case reported by Issam R. Hamadah et al, and Koji Sayama et al,  but in contrast to the former there was no lateral scalloping deformity of the buttocks in our patient. 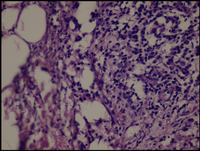 Vincent et al,  reported plasma cell panniculitis in a patient with Linear Scleroderma. The presence of plasma cells suggests a role of humoral immunity in the pathogenesis of Morphea and Scleroderma. 1. Person JR, Su WPD. 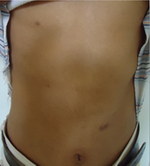 Subcutaneous morphea: a clinical study of sixteen cases. Br J Dermatol 1979;100:371-80. 2. Whittaker SJ, Smith NP, Russell Jones R. Solitary morphea profunda. Br J Dermatol 1989;120:431-40. 3. 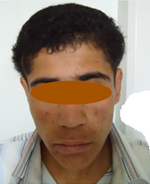 Issam R. Hamadah et al, Autosomal recessive plasma cell panniculitis with morphea-like clinical manifestation. J Am Acad Dermatol 2006;54:S189-91. 4. Sayama K, Chen M, Shiraishi S, Miki Y. Morphea profunda.Int J Dermatol 1991;30:873-5. 5. Vincent F, Prokopertz R, Miller RAW. Plasma cell paniculitis: a unique clinical and pathological presentation of linear scleroderma. J Am Acad Dermatol 1989;21:357-60.